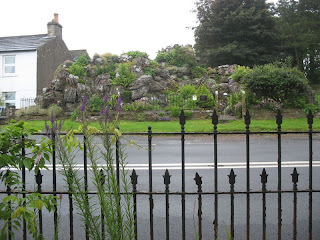 Across the street from Heather Cottage is an old-fashioned Victorian Rock Garden. Apparently, when it began, travelers would bring back plant specimens the way we bring back souvenirs, and plant them in their rock gardens. 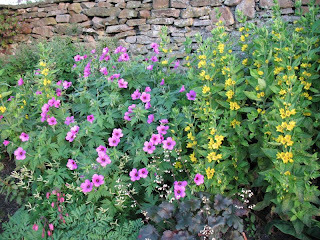 Much of this garden was alpine, the flowers and plants tucked into the rocky hollows. Follow the above link to learn more about its history, which began at the turn of the century. When the present owners purchased the house, it “came” with the Rock Garden, which was fairly run-down and in bad condition. Angela, one of the owners, has restored it and it is quite interesting. Quite a novelty. 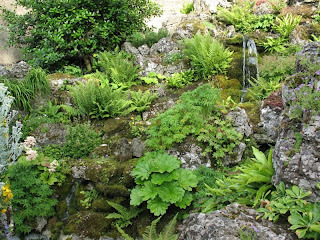 These plantings are amazing–from the street it looks like a small rocky hill, but it has a winding path past a motion-activated waterfall, under a rock bridge, around a few bends until the upper garden is reached. 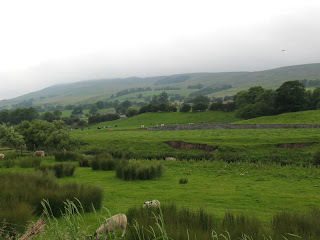 Looking back to the Yorkshire Hills through the rock bridge. Dave, enjoying the upper garden. 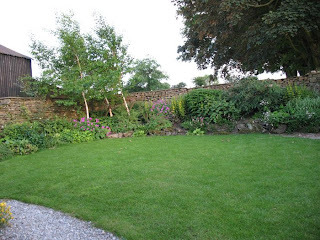 This area has a little bench, grassy area rimmed with large rocks and plantings. A quiet oasis. We watched the video about the restoration of the garden and several times Angela says she’s an amateur gardener. 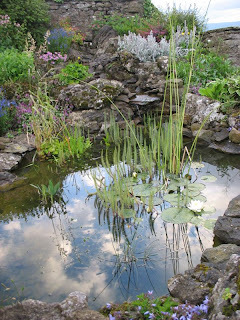 I guess in England that means they’re an expert, because in her backyard, on the way to the car and the hen house is this small rock garden, with teensy pond, and array of flowers in complimentary hues. A treasure. 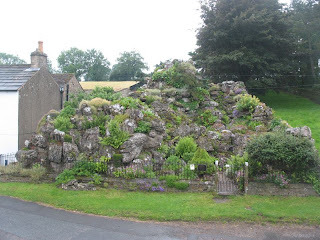 She said one time she was back here working, and a Scotsman (complete with kilt) admired her rock garden. She pointed out that the bigger one, the one they’d traveled to see, was across the way. I hope she smiled at that error–I’d be happy with this garden to gaze at. Notwithstanding the flowers in the bumper in the previous post, we did drive safely, arriving here on the afternoon of the 4th of July. 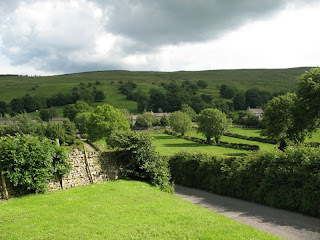 Our bed and breakfast (Heather Cottage, see next post) is at the bend of the road just before you head on to Hawes, site of Wensleydale Creamery. 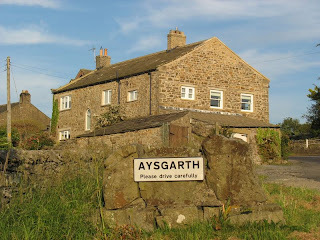 Aysgarth is actually about 3 blocks long, with two bends in the road. On one bend was our B&B, and on the other end was the George and Dragon Inn and Restaurant, where we headed for dinner. We walked in and they to go sit in the pub and have a drink while you decide what to eat. This pub culture was new to us–let’s be real–as non-drinkers all pub culture is new to us. We don’t drink, I said lamely, but we went to a bar stool in the pub area where the evening’s menu was written on a chalkboard. We watched the bartender–always an interesting sight–as we chose what to eat. 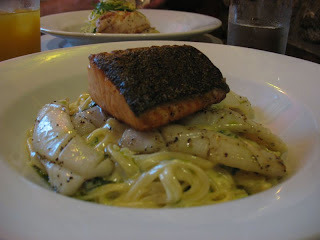 I selected squid and spinach pasta with salmon and Dave selected roasted chicken. 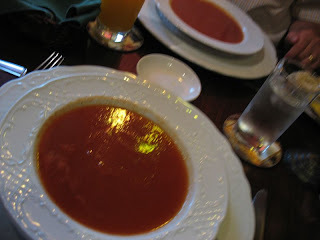 They wrote it on a piece of paper, and impaled it on the hook next to a number–our table number, I supposed. Then the waitress came and got us from the bar and took us to our table. Dave’s chicken was artfully stacked. One of the challenges of eating in a foreign country is trying to match up what you think you are ordering with what they are actually serving. I thought I was ordering a pasta that was colored black with squid ink and colored green with spinach, all with salmon. Wrong. I actually ordered SQUID and SPINACH and pasta with salmon. Yep, those long tubular shiny things are pieces of squid. 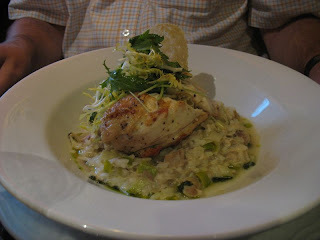 “Calamari,” said Dave, trying to be encouraging as I stared at my dish. I cut it up into ribbons, but could still taste the rubbery-ness with the strands of pasta. I managed to eat enough to be respectable, but let’s just say that the salmon was the high point of the meal. I’ve never been a fan of squid. 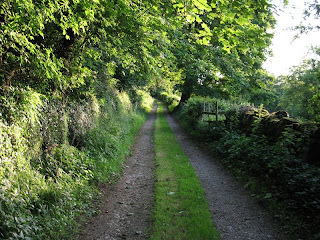 We walked the two blocks home (about 8 buildings) but the evening was beautiful and a little lane behind the B&B beckoned. What’s Harper Wath? we wondered. Later, at home I looked it up. 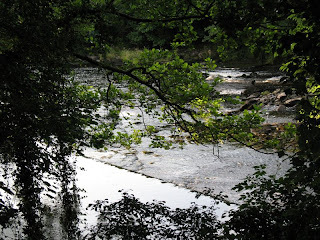 Wath: This surname suffix is said to be derived from the Viking word meaning “ford” or a shallow river crossing. Down the lane and around the bend was a small series of waterfalls and yes, you could have forded it at that point. 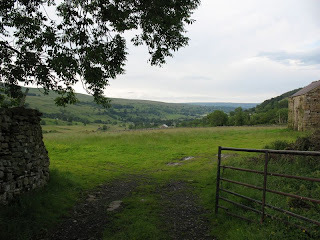 However, Dave thinks it led to another signpost that directed across the fields, heading upstream. 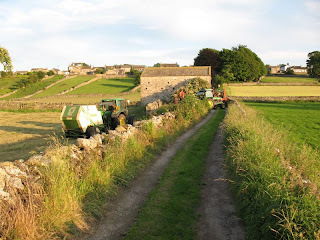 On our way back up, we saw these farm trucks moving across the field, then navigate the small opening in the rock wall. We waited while they moved on, then continued home. We loved this tree, photographing it many times. Dave braved the midges (and their biting) to get this sunset. “We are in serious babe country,” says Dave, looking around. “Not babe. Babe,” and makes the sound of a lamb bleating. Yes, we are in serious Babe country. 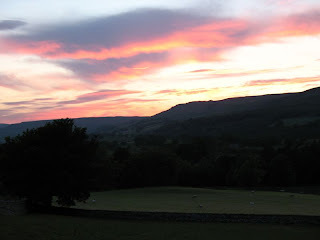 These photographs are taken over the next two days while we travel around the Yorkshire Dales National Park–where we’re staying. 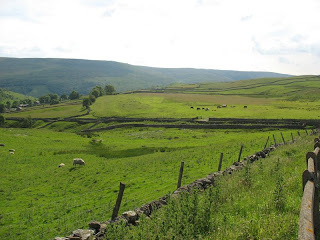 This area has many dry stone walls piled in zig–zagging rows across green fields, white fluffy clouds (well, today we had them), grazing animals; James Herriot, the man who wrote All Creatures Great and Small lived in this area as well. 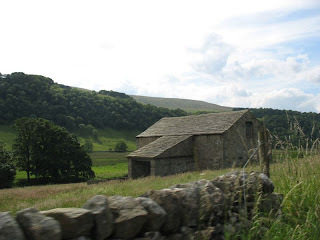 Another drive-by photo: I’m snapping as Dave drives from Grassington up the B6160 to Swinithwaite, through the Yorkshire Dales National Park. 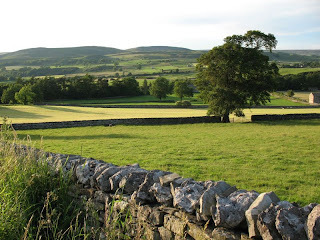 The scenery is bucolic, enchanting, all the cliches apply here. Okay, I’m finally “into” little English towns and they’re lovely. 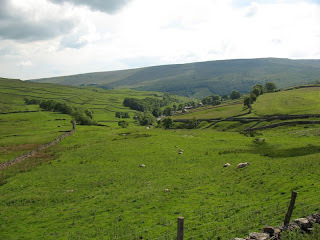 We pause at the crest of the hill (perhaps just past Buckden?) because I tell Dave he just has to see this vista. 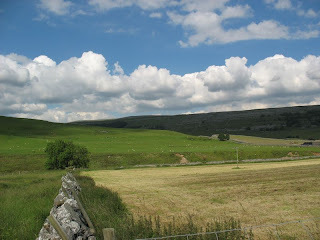 This photo is just after a rainstorm, the fields vibrant green against the gray-blue sky. 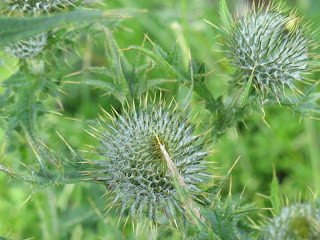 Thistles by the side of the road. 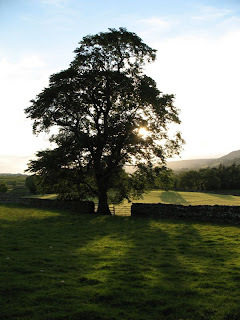 I’d seen this lone tree the day before as we drove and we went back to capture it digitally. 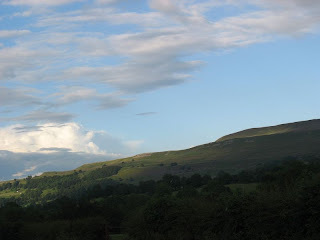 On July 5th, we headed to dinner near Newbiggin, but first drove up towards the summit of where we’d been the day before. The rainstorms had blown through, for the moment. 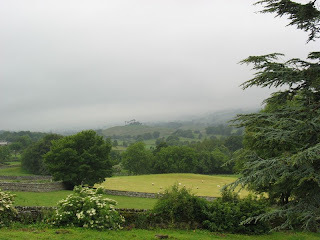 This is behind our B&B, taken after a rainstorm when everything’s misty and ethereal. I currently have this photograph as a desktop photo/wallpaper. 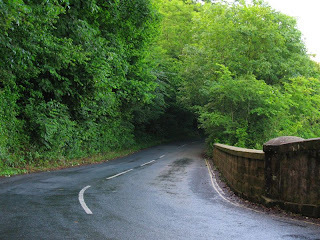 Dave liked how the trees grew as a canopy over the road. 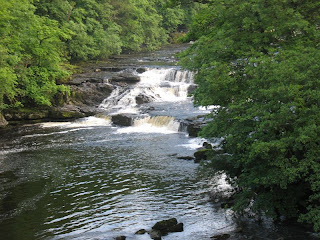 This is near Aysgarth Falls, or Fells: a series of short waterfalls. We’re used to looking for high waterfalls in the Western U.S., such as the drop in Yosemite, or Bridal Veil Falls in Utah. Here, the waterfalls are more like gentle cascades, with several short drops. 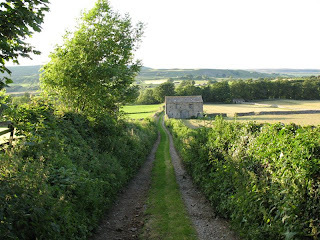 To celebrate properly, we decided that we should sing Our Country ‘Tis of Thee as we drove along small country roads. The tune is based on the English melody God Save the Queen. Fitting, we thought. We really owe a great debt to being of English lineage; when I say “we” I mean three of us: the USA, and both Dave and I. We left Fountains Abbey, and drove down a yellow road. I should explain. On the maps there are blue motorways (like an American freeway), green highways (some divided, most only two healthy-sized lanes with side shoulders), red roads (two lanes sometimes with a dashed line showing division). 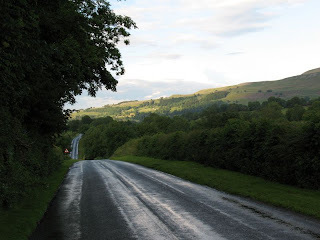 After that come the yellow roads, which have NO shoulders, no dashed lines, but are wide enough for two cars. And sometimes a farmer’s tractor and a car. The last one, which we went on for about 100 feet and quickly turned around are known, according to my niece Jessica, as the “white roads of death.” Well-marked maps clearly state that they are less than “4 metres wide.” That’s less than two car widths. Dave did pretty well. 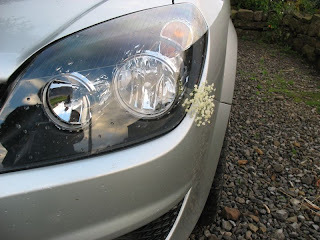 Only occasionally did I say, “a little close over here.” When we arrived at our destination one night we did find a tuft of flowers in our bumper, yet no finger dents in the door handle from the grip of death. I practiced zen-like deep breathing. Just kidding–Dave was fairly good at this by now. 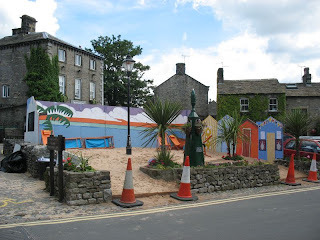 So, we headed on the yellow road to Grassington. Lots of websites raved about this little town. I frankly just wasn’t in the groove yet for little English towns. I guess my head was still in little Italian town mode. There wasn’t much there, really, but we did find the toffee shop where we purchased some goodies for the drive. 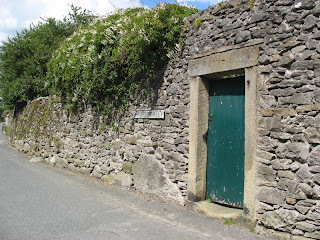 A wonderful shade of green, on a door in a rock wall. 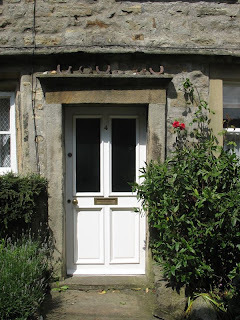 Loved the horse shoes over the door. For a long time, we hung a four-leaf clover over our front door. I finally gave it back to Matthew (who had found it), but I like to think that this brought us luck. 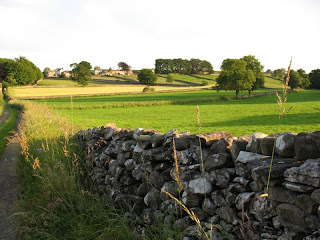 Finally, I’m getting in the mood for rock walls, green fields and small gray building-towns. But as we stride by, I notice they are hungering after Southern California beach. 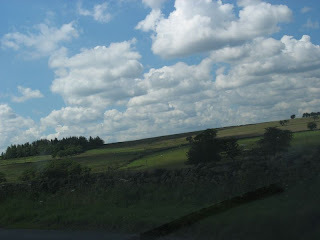 We toyed with the idea of driving to Whitby, but couldn’t execute (too tired). 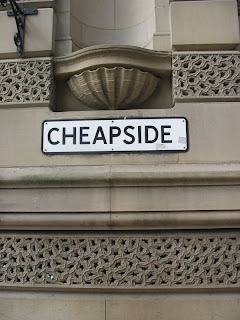 The prices in York at Hammond’s shop, already steep, seemed too high with the exchange rate of two dollars to a pound. So I passed on a necklace there. 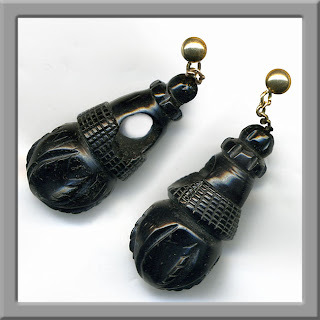 I wondered if I could find Whitby Jet in the netherlands, maybe at a jewelry or at antiques shop. 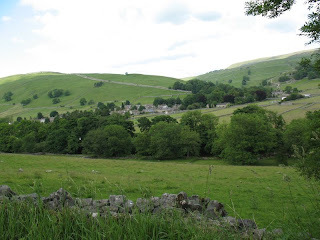 In Grassington, I visited with a woman in a jewelry shop about Whitby Jet. She said it should sound like plastic when you tap it against you teeth. If it sounds “sharp” then it’s French Jet, and is made of glass. I asked her if she had any for sale, and she didn’t. But she did bring out her collection of jet bracelets that she’d picked up at auctions. With her permission, I tapped the stones of one bracelet against my teeth–yep, sounded like plastic. She wouldn’t sell any of her bracelets, and there was no other in the shop. Although Dave and I looked for it after that, it was not to be found. 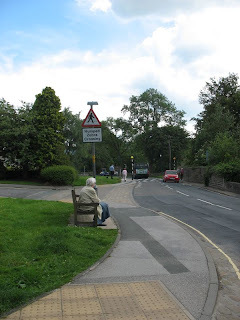 Couldn’t resist taking a picture of this sign–Humped Zebra Crossing–which meant the stripes painted on the speed bump on the road, not the lady waiting on the bench. This is a post from our trip to Italy and England, July 2008. Fountains Abbey is in ruins. 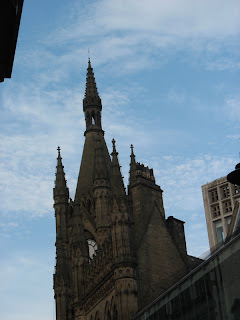 I liked this church very much, as the structure, not the decoration, was the emphasis. 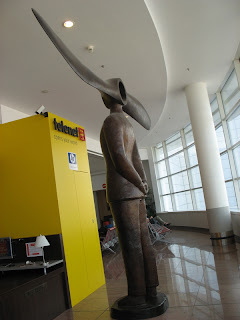 No windows, statues, mosaic floors (except for one)–just the walls, the layout and the gloriously sunny sky. This was one of our more well-documented sites. 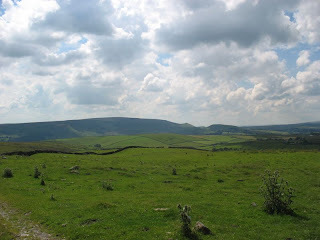 This is the view taken from the abbey guest house, also in ruins. 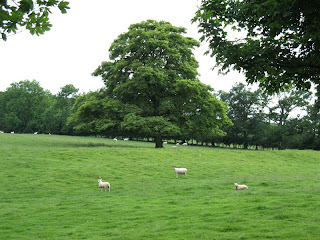 The abbey ruins are approached from walking through pastures above the site, and the tower aside the north transept is visible just over the trees. We read from the guide pamphlet as we walked around, and I’ve excerpted some of it below. 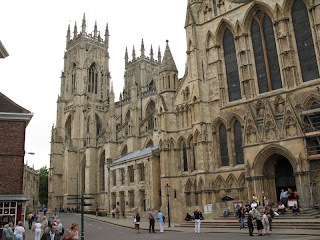 A group of monks left St. Mary’s Benedictine Abbey in York in 1132 to found a more devout monastery. One of their vows was not to be within an arm’s length of each other, so this abbey is very large in scale, although it only housed about 80 choir monks. I found a map that identified what all the parts of the structures were at one time, plus I’m getting the hang of this church logo after all the churches we’d toured thus far in our trip. View from what would have been the front door, toward the window behind the high altar. 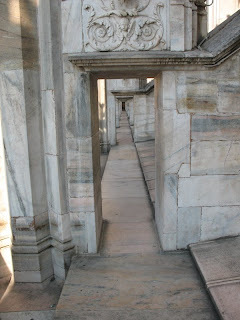 The side corridor flanks the nave, with small hollows where chapels used to be. Most of the abbey buildings date from between 1140 and 1270, though the north tower was added during King Henry VIII’s reign. Through the roof and side chapel to the tower. We weren’t allowed underneath to look up: falling rocks. The window over the front door. This little settlement at Fountains was part of the austere Cistercian Order. View from the high altar towards the back of the abbey. The only mosaic left was the altar floor. The abbey was closed down in 1539 and the Abbot, the Prior and the monks were sent away with pensions. The estate was sold by the Crown to a merchant, and remained in private hands until the 1960s. 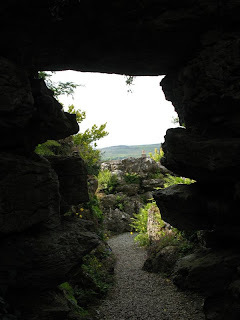 Between the high altar and the huge window, was an area they identify as the Chapel of the Nine Altars. This view is looking toward the north side of that area. Looking from the south side of the Chapel of the Nine Altars through to the infirmary passageway walls. 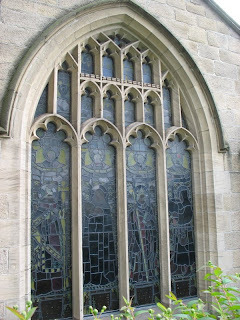 Windows of a small chapel in the South Transept. The nave is the portion of the church that runs from the front door to the back window, and the transept runs crossways, forming a cross-shape. At that intersection in this church is the choir and, except for the built-in seats, is indistinguishable by any remnants. 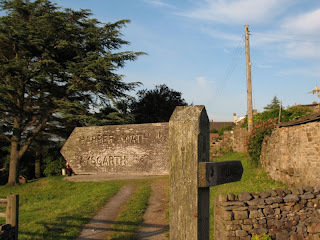 Maybe it was because in the early 17th century, Sir Stephen Proctor build a mansion using sandstone blocks and a stone staircase from the abbey. However I’m sure this cleaned-up version of an abbey that we see now happened only after carting out tons of fallen rock. Several groups of school children were there. They donned habits to emulate the monks. 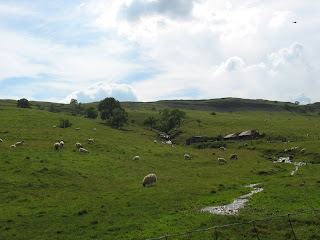 The 80 choir monks were known as “white monks” because they wore habits of undyed sheep’s wool. 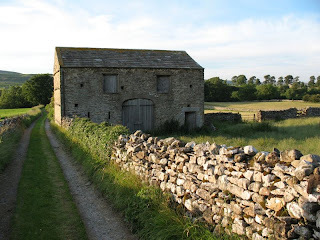 The lay brothers worked the farms (or granges) that belonged to the abbey and they wore darker wool. They may have numbered several hundred in the early years. 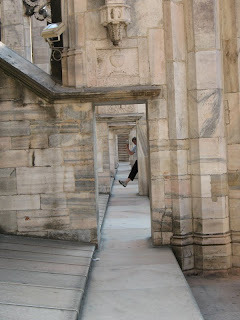 We are on the south side of the cloister, a large square area that is on the other side of the side corridor of chapels. 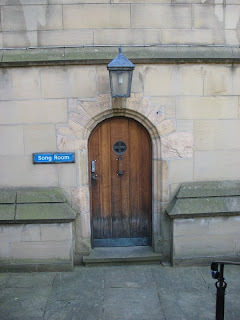 They are passing what would have been the doorway to the Chapter House. View into the Cellarium from above. Above the Warming House. I liked the blue light on the stone floor. The vine-covered walls in one corner of the cloister. The Cellarium, or as they refer to it on the map, the Lay Brother’s Refectory. They had a separate eating area for the monks. One end of this was for their “stores” and the other is where they ate. It’s all mossy and green, but intimate with its low, yet vaulted ceiling. Looking again toward the high altar and the Chapel of the Nine Altars. 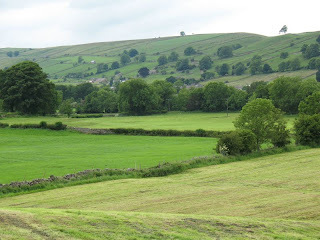 We decided to walk down along the meadow, catching a different view. 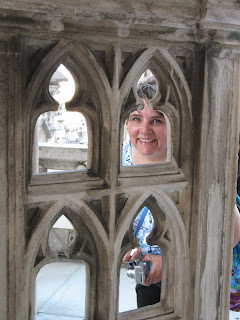 We took the “High Ride” walk up in the forest to Anne Boleyn’s Seat and Surprise View. The Half-moon Pond is a nice counterpoint to our surprise view. 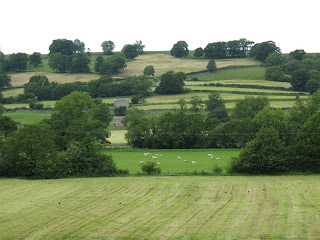 John Aislabie inherited the estate in 1693. He was the Member of Parliament for Ripon and became Chancellor of the Exchequer in 1718, but was discredited for his part in a financial scandal just two years later. After spending some time in the Tower of London, he retreated to this estate and threw himself into plans to create a formal water garden in the River Skell Valley. This project kept him busy for the rest of his life. The Temple of Piety was first named Temple of Hercules, perhaps to commemorate the huge labor of constructing the garden. In 1768, the temple was furnished with “six chairs, a tea table and a little stand,” which gives us an idea of how it was used in his day. A statue of Neptune, the Roman sea-god (1740), stands in front. 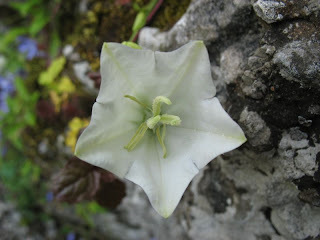 William Aislabie, John’s son, took over and worked on some of his own ideas from the garden, fashioning it into a more natural state, which was popular at the time. In 1768, he managed to buy the abbey ruins, “securing the romantic vistas along the valley,” says the guide sheet. The High Ride walk (with the Surprise View) was his creation. He holds the record as the MP with the longest period of continuous service: 66 years. “The Cascade” is a the last small falls in the Water Gardens, but the place where John Aislabie began construction. The work took three years, as nearly 100 men were needed to dig the canal. We didn’t see everything, but enjoyed the day in the gardens. Stopping back by the visitor center, we had a bite to eat before driving further into Yorkshire. 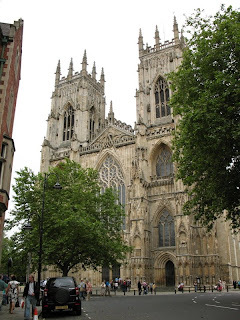 York Minster is England’s largest medieval cathedral, complete with stained glass windows, lovely wooden carved choir seats and Gothic everythings. 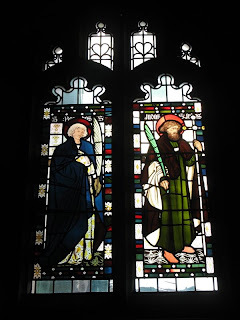 It also has the Semaphore Saints, but more on that later. 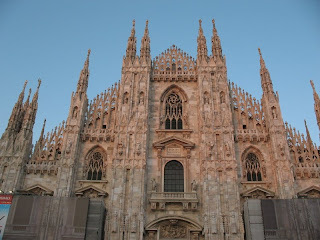 We approached the cathedral from the side, and could see the massive bell towers. 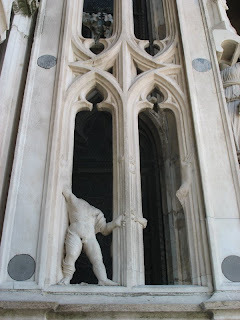 This is the south transept entrance, where they shake you down. No, I didn’t mean that exactly, but the cathedral does exact an entrance fee. Luckily we’re readers of Rick Steves and knew to wait until the evening song service: Evensong, when they don’t charge you to go to church. The first church on this site was a wooden chapel built around 627, and after that was a Roman basilica, followed by a church built by St. Wilfred (which was destroyed during William the Conqueror’s reign). I’m getting all this from my guide book, which goes on to detail the first Norman church, which we saw fragments of when we took the tour of the undercroft. This present building dates from 1220 and took about 200-plus years to complete. 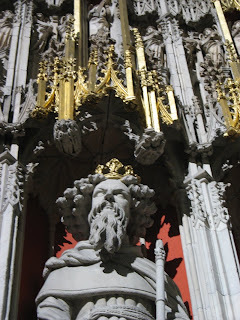 They ushered us for Evensong, and we sat in the carved choir seats. The choir filed in: men on one side, young women (ages 17 down to about 7, I guess) on the opposing side. Listening to the organ, sited atop the choir screen, and the voices of the choir was a subliminal experience. I enjoyed the topic of the evening prayers: first, for those who are judges in the land, and secondly, those who are victims of knife crimes. 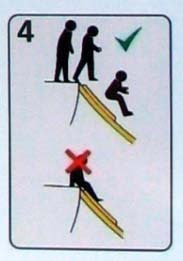 The prayer’s specificity really made me think about these two sub-groups of society. Usually we bless the “poor and afflicted,” and leave it at that. But during the prayer I did think about judges, and the difficulties they must face. I am less familiar with knife crimes, but did feel blessed that I am less familiar. 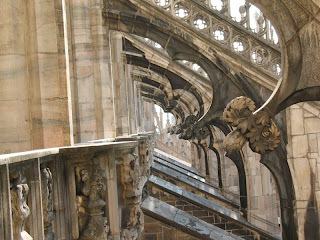 After the last notes of the organ faded away, we were allowed to walk around the cathedral and take photos. This is of the choir area. 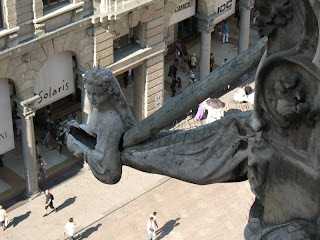 If I looked directly overhead, these angels were in the carved wood of the seat. The ceiling of the cathedral is wood, painted to look like stone. View from the choir area to the back of the church. The large rose window in the choir area is under reconstruction, so we couldn’t see it. This window is known as the Five Sisters Window, with sections over 15 meters high. 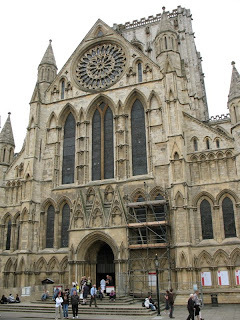 It is the minster’s oldest complete window, dating from around 1250 AD. The organ pipes are painted decoratively. From the back of the nave, looking toward the organ and the choir screen. The choir screen depicts the 15 kings from William I to Henry VI, and they all have wonderful and wild hair. The Semaphore Saints. It’s a sculpture from 2006, and is at the very back of the church. On the last chair, they’ve left a chart so the viewer can figure out what they’re saying. I didn’t, but did enjoy them. 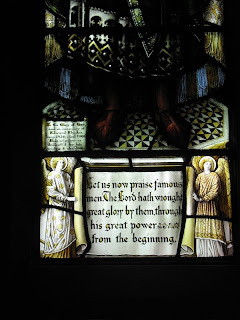 After Saltaire, I dropped my traveling companion back at the hotel (the wife of one of Dave’s colleagues: Helen) and decided to go and see some stained glass. 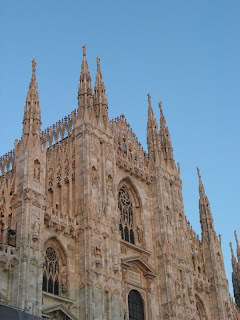 I was going through withdrawal after all of Italy’s cathedrals and basilicas. The main church was about 3 blocks from our hotel and is called The Cathedral Church of St. Peter. 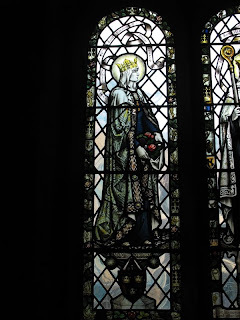 It’s Anglican, and has a simplicity about it that allowed me to engage in a way I didn’t in the large cathedrals in Italy, although they are probably more showy. 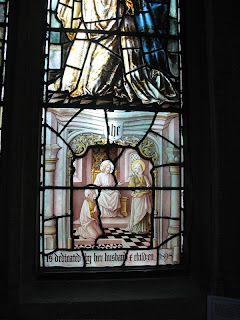 I walked through the church close (church grounds) past this window. Although I love stained glass windows, sometimes the outsides, with the structure of the window more evident are just as intriguing. 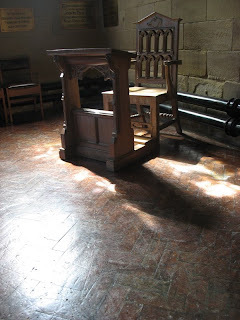 They had several panels in this small chapel and I liked how the light fell on this chair. The faces and the detail in the clothing was pronounced, like a picture drawn in inks. I have thought about this and wondered if it was because the glass was so close to me–I could have touched it. Most other glasses are so far away. 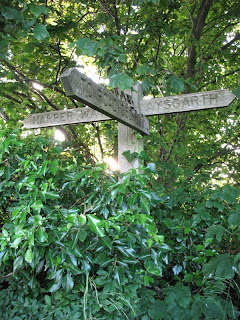 Mary and Martha with Jesus–a parable I’ve wrestled with more than once. Busy by inclination in my younger years, I would retort that someone had to get the meal ready. But maybe this parable could reference one woman, but at different ages of her life: the busy years–with Christ reminding that woman to take time to study and drink of the Living Water–and the later years–when contemplation takes more of a center stage as the capacity for busy-ness wanes. Obviously I still wrestle with it. 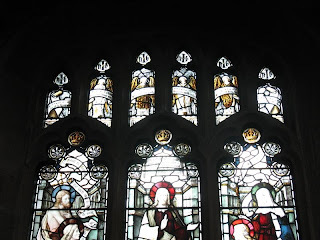 William Morris has three windows in this cathedral. 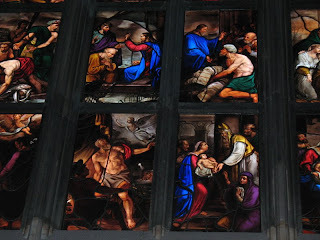 Contasted with the other stained glass, his are “simpler,” more linear. 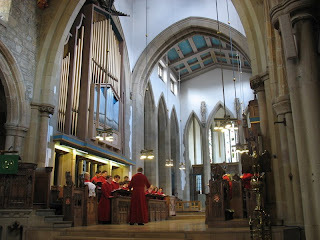 Of course, all this thinking about gospel themes, led by the windows, was enhanced by the choir and organ practicing for Evensong later that afternoon. Every house should have one. 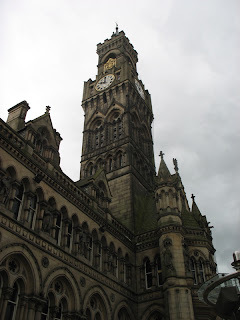 Bradford England was once the center of the wool trade for England, even rivaling London for importance. I have also learned that all England’s larger cities say this at least once in their tourist information. 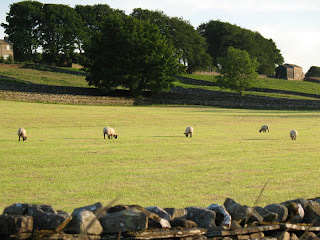 But because of its location to water, people, and most importantly, the sheep, I do think Bradford had an edge on this category, at least for a while. But first, getting the car. 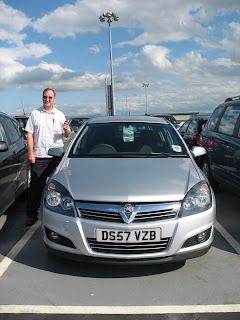 Dave is not standing on the wrong side of the car–it’s the English driving thing–steering wheel on the right side of the car. From here we went down to the parking garage’s next level and drove around there, practiced pulling into a space, then out of a space, then down to the next level where there were more cars, etc until we (he) felt brave enough to try a real road. Kind of like Driver’s Training all over again. The motorways are really nice. We had no problems getting to our destination until we got off of them, then Good Luck. Street signs seem to be absent nearly everywhere. If you do see one, it’s on the street that intersects yours. You’re supposed to know what street you’re on–difficult. 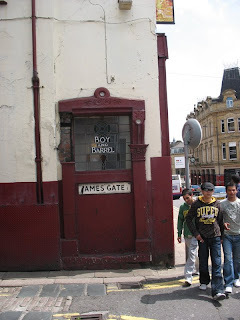 Bradford’s buildings are solid-looking brick buildings, built in the last century. This is City Hall. Love the names of the streets here. This place is one of those dying cities, the prime of the wool trade long past and no new infusion of cash or a viable industry. The old Wool Center building–rather gothic-y at the top. Now it’s a bank. 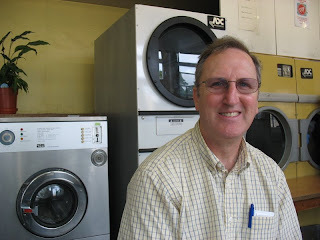 Dave’s smiling because at long last–we have clean clothes! 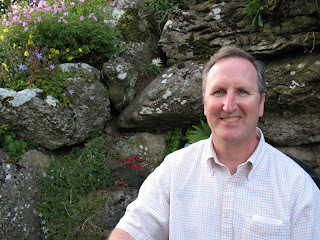 We ran into a tour guide operator in Bergamo Italy and I asked him for tips on travel. “Febreeze,” he said. I laughed, but after 8 days of traveling, if we hadn’t found a laundromat, I would have bought some to freshen up our clothing. 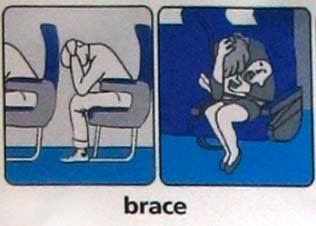 When ditching the airplane, passengers are instructed to remove their heads. If you have a baby this hideous, yes, you should definitely brace yourself. 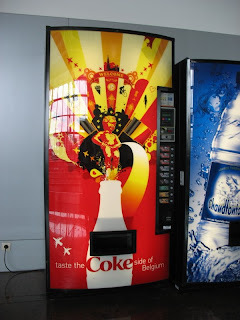 We laughed when we saw the Manneken Pis statue on the front of a Coke machine. Really makes you want to buy a soft drink, eh? 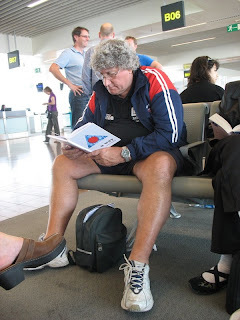 I just want you to know that the British Judo champion also traveled on our plane. It said so on the back–and front–of his jacket. 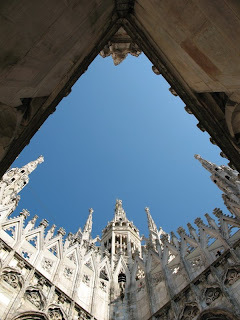 When we came out of the subway to the heat and noise and bright afternoon sun, the Duomo was sparkling white. 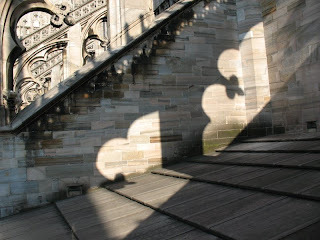 This shot is taken late in the afternoon, when the cathedral assumes the rose colors of the descending sun. 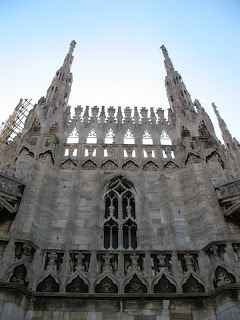 The Duomo inside is rather dark, with deep gray stone (although if it had light, it might look differently). 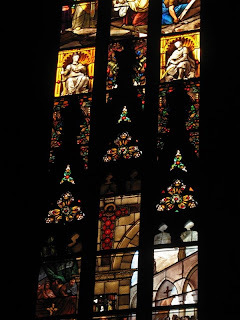 We focused on the light: Dave’s shot of the stained glass is clear and vivid. I liked the two brilliant yellow spots, as well as the “pomegranate” Christ in the lower center. 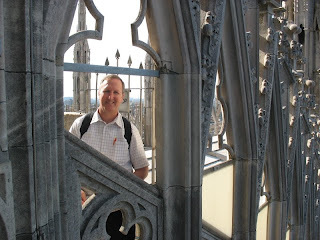 As per our niece Alice’s advice, we took to the roof–in an ascenseur (or elevator). 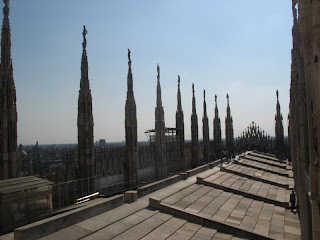 This is atop the nave, looking from one end to the other. 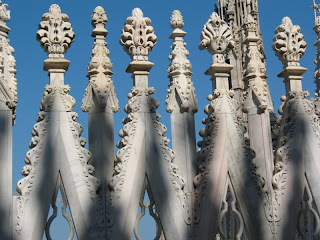 A very Gothic place, this roof. 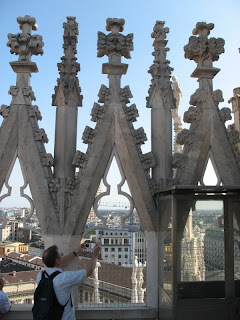 No wonder it took them hundreds of year to complete this thing. Love the framing on Dave’s shot, above. 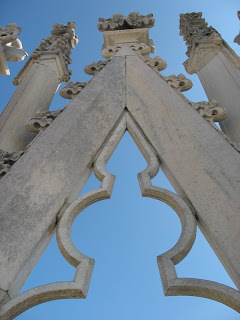 We migrated to the backside, where the spires provided lots of shade and hung out there, exploring all the detail. 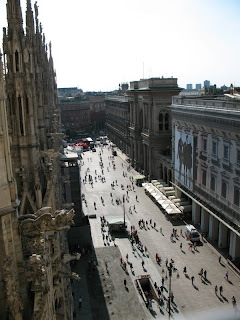 The Vittorio Emanuelle II from the roof. Dr. Dave, taking a shot. Among all the hundreds and hundreds of statues, not too many women were represented on this roof. It seems like most were consigned to the downspouts. The repetitive elements intrigued us. Goofing around on the roof. I’ve had days like this. 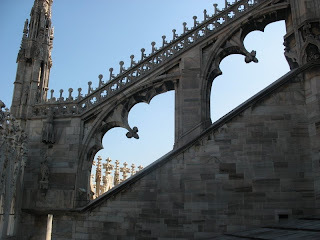 These buttresses are huge, but because the entire cathedral is so large, the scale is lost. Back down on the ground, and after dinner, we looked more closely at the closed doors. 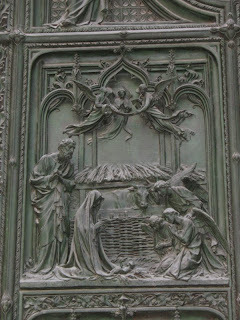 Dave captured the nativity. 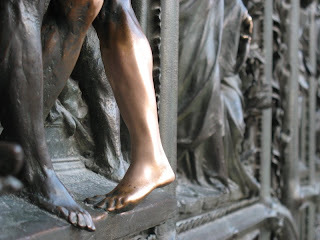 I was intrigued by where the bronze had been shined up by pilgrims’–and tourists’–hands.